Your first thought when buying a car is always the same: new or used? The process of buying a domain name starts the same way. Do you want a brand new domain or an expired one with previously established traffic? The benefits and the drawbacks are similar, but choosing the right domain depends on your needs, your domain name budget, and the competition within your industry. Learn how to make the right choice that further establishes your business online. Like that new car smell, a new domain name feels fresh and ready to get you down the road in style. Without any of the history of being previously owned, you don’t need to worry about inheriting a bad reputation for spam, or shady business dealings. 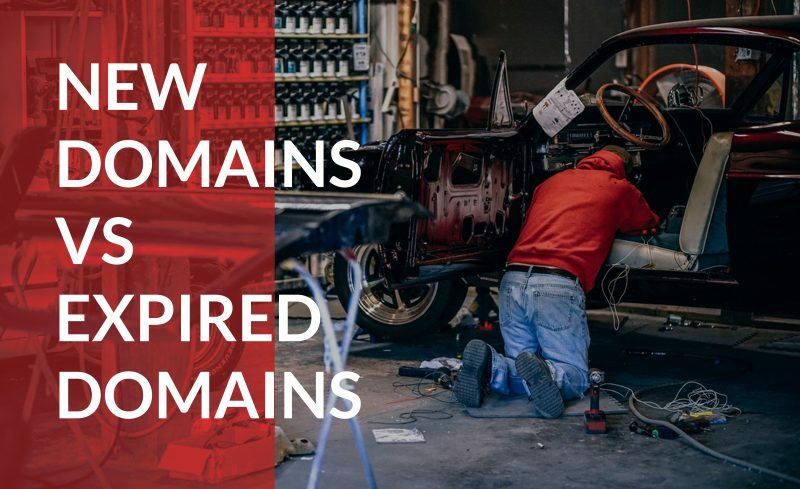 Just like a new car though, new domain names have no miles on them, which means you need to build web traffic and build an audience from scratch. It also means that you’ll need to build all of the infrastructure yourself, such as a website, and social media pages to start building your marketing channels. If you’re looking for a domain name that gives you a leg up, you may instead want an expired one. Imagine buying a used car and finding out that the previous owner swapped in a new turbocharged engine. And racing stripes. If you purchase a reputable expired domain name, there’s a chance there’s already an audience, established backlinks, and incoming web traffic heading your way. This gives you a leg up when you put marketing spend towards your new business, making it easier to reach customers and convince them to buy. There’s still the downside of not knowing the full story behind your domain name when you purchase it second-hand. There may be a negative reputation from spam which you’ll have to overcome. Make sure to do your research on a domain name and then run a WhoIS search to try and find the owner. Your business and your goals, both short term and long term, affects your decision whether to buy a new domain name or an expired one. Looking across your industry reveals your options. In a competitive market, having a starting with traffic and previous backlinks helps to start your business as an equal to established business instead of starting behind. If you don’t have many competitors, starting from scratch with a new domain name can still lead to success, as your levels of traffic soon builds to that of the other brands with the right strategy. If you’re looking to start slow and grow your business from the ground up by making all of the decisions yourself, you’ll likely need a new domain name. If you’re looking to get a head start and want to hit the ground running with web traffic that you can build on, then look for an established domain name. Some people like driving a new car off the lot, while others like to brush off a little dust and change the oil before hitting the road. Whether you buy a used domain name or a new one depends on what you need for your business. Do you need a domain with some previous web traffic or are you looking for a fresh start? The right choice helps establish your business online and help to reach the right customers.